The simplest way to develop a Joomla! 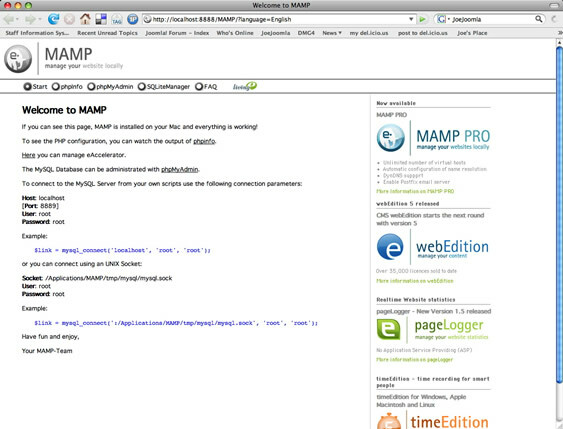 site on your local Mac OS X computer is by using MAMP. 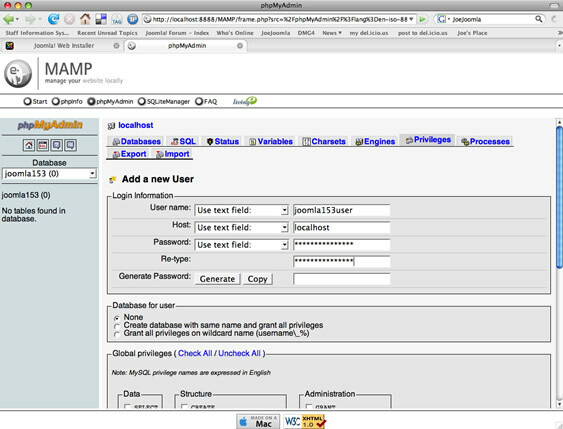 MAMP is short for Macintosh, Apache, MySQL, PHP. MAMP works just like an application. It is released under the GNU General Public License. You can download MAMP from Living-e AG. The download page can be found HERE. 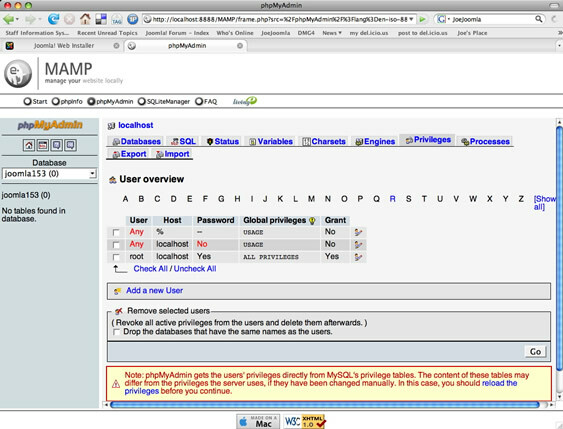 Current MAMP versions require Mac OS X 10.4.x. If you're running Mac OS X 10.3.x you can download an earlier version of MAMP 1.4.1 (universal binary), for Intel and PowerPC. 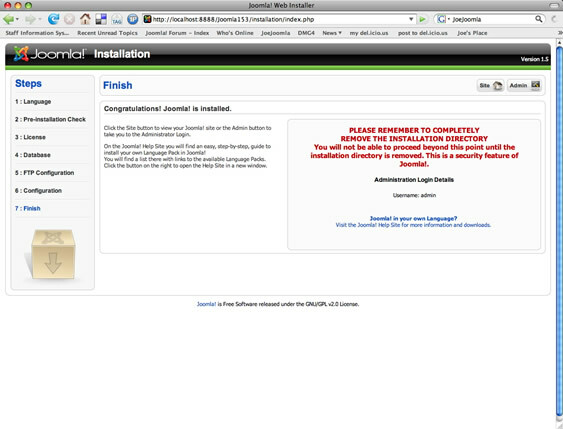 Previously this site covered installing Joomla! 1.0x in the MAMP environment on your computer. Now that Joomla! 1.5 is available as a stable release you may want to install version 1.5 site on your Macintosh computer using MAMP. The two versions of Joomla! install methods are very similar but there are changes to Joomla! 1.5 that you can get familiar with here. As of this writing MAMP is a Universal Binary version 1.7.1. The download is a 127 MB disk image. There is also a MAMP Pro version that you can read about HERE. This article will deal with the regular and free version of MAMP. MAMP is installed on your computer in your 'Applications' Folder. In order to work properly the MAMP folder must be located in the Applications folder. You should also have at least 250 MB of free space on your hard drive. 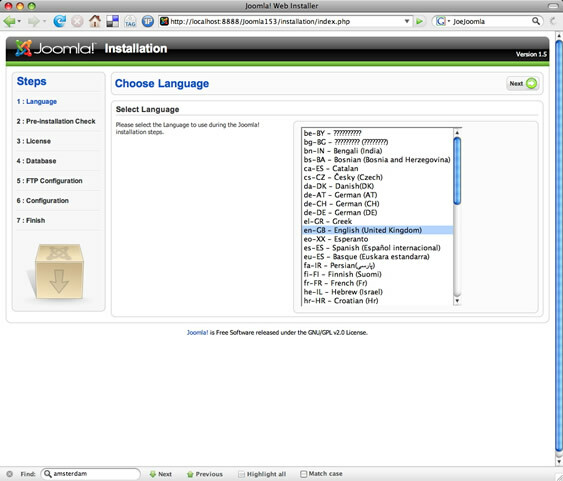 Once MAMP is installed on your Mac you are now ready to install Joomla! 1.5. Get the latest full install of Joomla! from joomla.org. On the home page of joomla.org There is usually a banner with a button to download Joomla! When you click that download button you may be taken to a page which offers a couple of compressed install package options. The install packages come compressed as a .zip, .tar.gz, and .tar.bz2 compression. Your Macintosh OSX computer can deal with any of these compressions. Pick the one of your choosing and download that to your computer. Let's say that you chose the .tar.gz package. Your download will likely be called 'Joomla_1.5.11-Stable-Full_Package.tar.gz'. Note that '1.5.11' will change as newer releases of Joomla! are made available. Uncompress this package on your hard drive by double clicking it. Your Mac OS X computer will expand the package into a folder with all the folders and files inside that you require for your install. You can change that expanded folder name into something simpler like Joomla1511 for instance. That's what we'll use for this article. Move this entire Joomla1511 folder and its contents to the MAMP application and put it inside the folder called 'htdocs'. The path to the 'htdocs' folder will be /Applications/MAMP/htdocs. 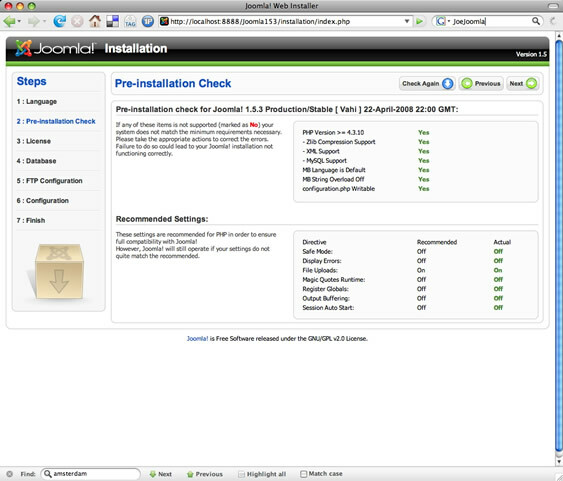 Now you are ready to install Joomla! 1.5. You can start MAMP, the application is inside the MAMP folder. It's simply called 'MAMP'. When MAMP starts up it should launch your web browser, if it isn't already running, and take you to a start up page with a URL of http://localhost:8888/MAMP/?language=English. You still need to create a username and a password for the database. So lets make a username and password for our joomla1511 database. 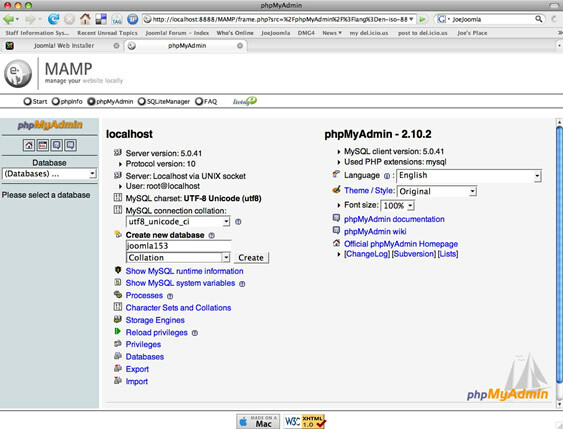 Click the home icon button in the left column of the phpMyAdmin screen. When the screen refreshes you should see your database name 'joomla1511' with (0) beside it. Turn your attention to the middle of the page near the bottom and look for 'Privileges'. Click the Privileges link. Here is the screen where you will fill in the Username, Host, and Password for your database. You could use 'root' for the username and password but I don't do this. By making a specific username and password for the database you establish good security habits. • In the 'Host' field type in 'localhost' (without the quotes). • In the 'Re-type' field verify your password by typing it again exactly as the field above. A little further down the page is 'Global privileges' You can click the link 'Check All' and checkmarks will appear in the Data, Structure, and Administration boxes. Once you have done this go to the bottom right corner of the screen and click the 'Go' button. After the screen refreshes you should see 'You have added a new user.' results. Now you are ready to complete your Joomla! 1.5 installation. Note: if you changed the name of your Joomla! folder to something else, put it in the place of 'Joomla1511' in the above URL. This URL will take you to Step 1 of the web installation page for Joomla! 1.5. The first page is the language selector. Pick the language of your choice from the list on the right side of this page then click the 'Next' button on the top right of this page. Next screen is Step 2: Pre-installation Check. 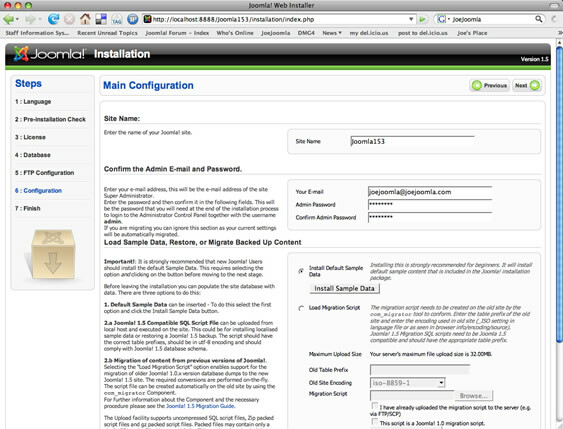 You'll see a list on the right side of the page with information about the installation environment. You want to be seeing green and not red results to the right of the directives. If there are items marked with a red 'No' would need to correct them. Since this is a MAMP install there shouldn't be anything marked with a red 'No' so you are good to go. Click the 'Next' button on the top right of this screen. Next page is Step 3: License. This is the Joomla! GNU GENERAL PUBLIC LICENSE. You should become familiar with the license. When you are done here click the 'Next' button on the top right of this page. Next screen is Step 4: Database. The right side of the screen is where you need to fill in information about the database. • By default the Database Type is mysql. We will leave it set to this. • Password - this is a password for the database username. Type in the password you used when creating the username and password in phpMyAdmin earlier. • Database Name - This is the name of your database. I used 'joomla1511' (without the quotes) when creating the database earlier in phpMyAdmin. Below the Basic Settings are Advanced Settings. In the Advanced Settings you can choose to Drop Existing Tables of an already set up MySQL database you might be using with a Joomla! install. You can also choose the option to Backup Old Tables. Since this is a new Joomla! 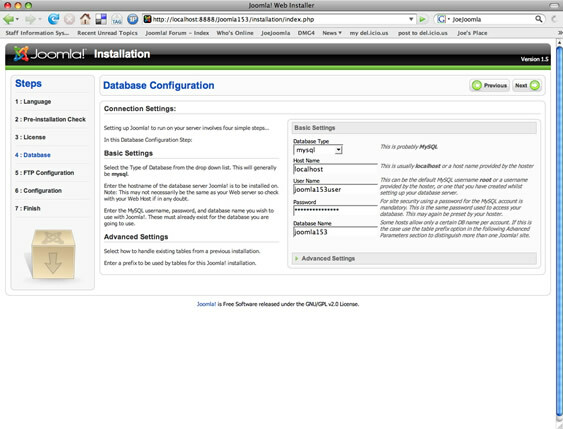 install with a new database being created we there is no need to make any changes here. When you are done here click the 'Next' button on the top right of this page. So if you have all the information filled in the fields you can click the 'next' button on the top right of this screen to take you to step 5. If the information was filled out correctly on the previous screen you will be presented with Step 5: FTP Configuration. If instead you get a screen telling you there was an error, go back and complete the previous steps correctly. The FTP basic Settings are set by default to 'No'. You can click the radio button and set it to 'Yes' if you like to Enable the FTP file system Layer. I use this in my MAMP environment to enable the use of an ftp program to update the Joomla! install when there is a new version of Joomla! released. Since you set the Enable FTP file system Layer you will need to fill in the FTP User, FTP Password, and FTP Root Path fields. • FTP User - The FTP User for your local computer should be the short name of your computer login name, or the name that appears beside the 'Home' icon in your finder window. 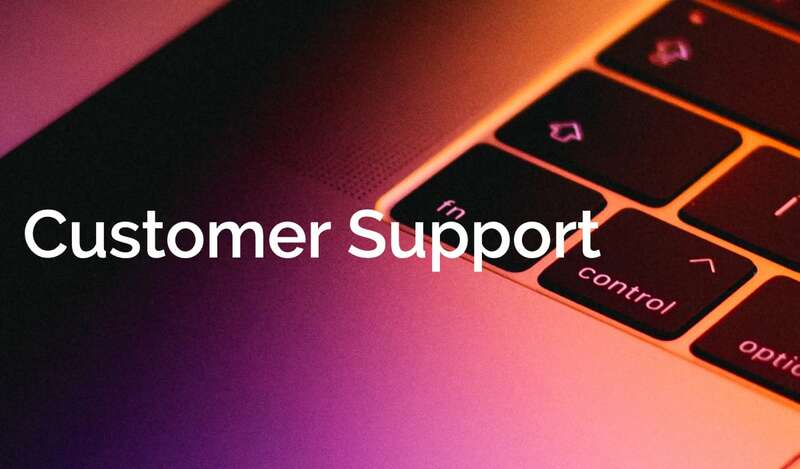 If the name of your User account on your Mac is 'Joe Joomla' then your username will likely be 'joejoomla' (without the quotes). This is the name you will put in the FTP User field. • FTP Password - In this field you would put your user login name for your computer. This is the name you type in the login screen when you have logged out of your computer. If you used a different named for your Joomla! install folder then use it instead of joomla1511. You should click the 'Verify FTP Settings' button to ensure that the information you filled in is correct. You will get a confirmation message telling you the settings are valid if the information is right. Under the Basic Settings is 'Advanced Settings'. In the fields you will see FTP Host with 127.0.0.1 filled in. You should change this to the IP address of your computer. You can find the IP address of your computer in the Network preferences pane of your System Preferences. The IP address of your computer may change depending on how your computer is set up. 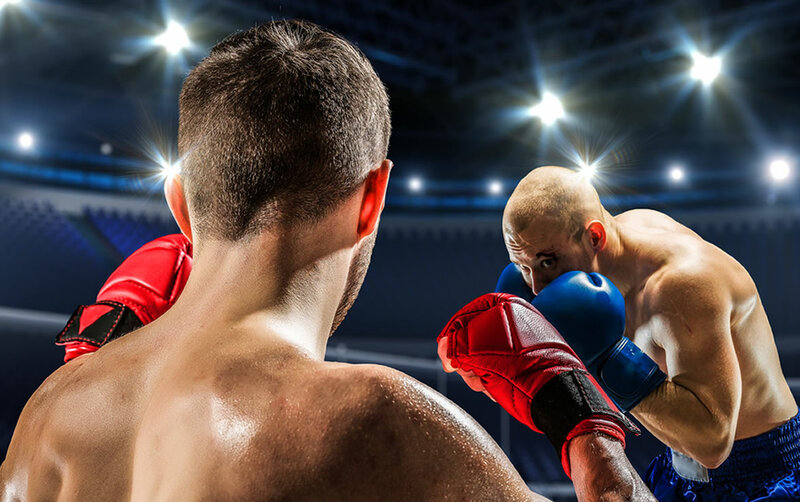 If you use DHCP to get an IP address when connecting to the Internet, then you will need to keep an eye on this and change it in the Joomla! admin Global Settings screen when necessary or you can simply leave the Basic Settings for FTP Configuration set to 'No' on this screen. You won't be able to use FTP layer if you do this but you can always enable it later, if needed, in the Joomla! Global Settings. Step 6: Configuration - On the right side of the screen are fields to fill in. • Your E-mail - Put in your valid email address. Joomla! can send notification emails to you. • Admin Password - Put a password in here. This will be the password that you will need to login to the backend administration screens for Joomla! • Confirm Admin Password - It must be typed in exactly as the Admin Password field above. Below these fields is a radio button to Install Default Sample Data with a 'Install Sample Data' button. It is a really good idea to let Joomla! to install sample content for your new install. It helps you to see how things work in Joomla!. You can unpublish or even delete this content later as you add your own content to your site. Once those two items are removed from the Joomla! 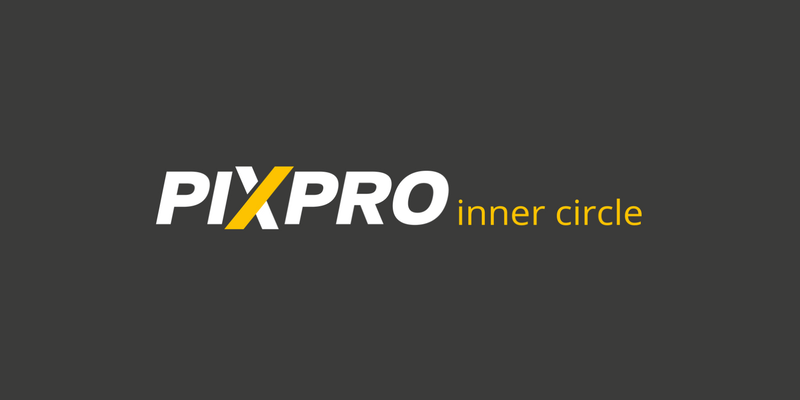 installation folder you can then visit your front page or your Joomla! admin area. At JoeJoomla we are motivated by a desire to create great looking websites that are easy to use and produce results for the people and companies we work with. We specialize in Joomla which many web professionals agree is the number one open source content management website system available today. We're good listeners. We hear what you have to say and use our experience to provide solutions for the things you want to achieve. Let's work together and do some great things! We've shared our knowledge and experience with the community at large all over the word at both large and small events. We do this because we are passionate. We are in his for you. Our reward comes from doing a great job for you. We are highly creative but not at the expense of your brand. Some designers just want to create pretty looking websites but that’s not us. The awards we have won for our websites are not just because they look good, it is because the whole package, purpose and tactics made sense for the client. We approach the creative process with your goals in mind. We create great looking websites that are easy to use and bring you business. Isn’t that what you are looking for? You’ll enjoy working with us. We are fun and easy to get along with. We have experience from the simplest of projects to large, complex and customized solutions. We specialize in Joomla! It’s open source software free from expensive licensing. Why spend your dollars just for the privilege of using the software? Wouldn't you rather be investing your money into branding and content? We know Joomla! and it's the only platform we support. We don't try to be master of everything, just one thing. 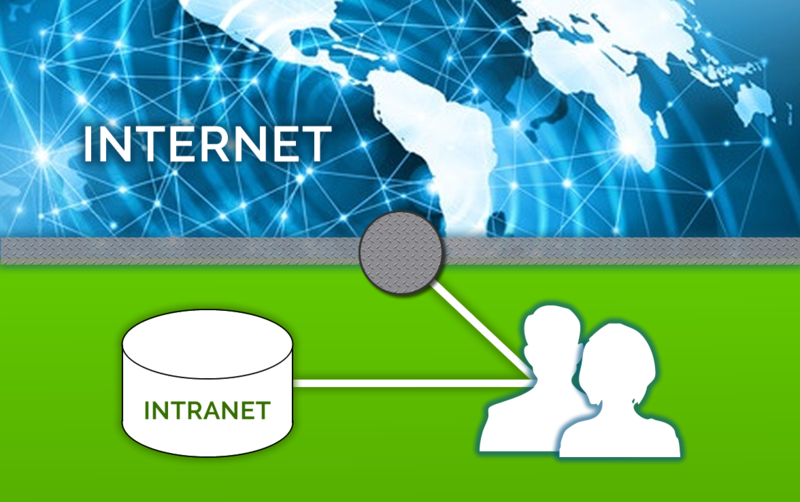 We're connected closely to the Joomla! community and all our friends are Joomla! professionals. If there's ever a problem we know how to find a solution. We look out for you. We only host Joomla! websites. Other hosting services want everything and anything. We're not after quantity, we are into this for quality. Our Joomla! optimized hosting platform is custom-built to power quick-loading Joomla! sites. Our server technology is state-of-the-art and we want your Joomla! site to be fast! Since Joomla! is the only CMS we work with, we're able to fine tune all of our equipment specifically for Joomla! When updates to Joomla! or any of your Joomla! 2.5 and up extensions are available we can do the updates for you. You can also choose to do them yourself from the backend updater in your Joomla! website. Have you’ve inherited a Joomla CMS website and it’s unfamiliar to you? Is the company website part of your job responsibilities along with all the other things you have to deal with in a new position? Has the original design firm who set up and maintained your website gone and are no longer available? Don’t struggle, get Joomla training! We’ll teach you Joomla best practices so you get the most out of your website. Joomla is a powerful application framework that can incorporate sophisticated add-ons to extend it’s power into virtually unlimited directions. You never need to be painted into a corner. What's different about JoeJoomla Joomla training? We customize your Joomla training to your specific environment. Generic training often covers things you may never need or want to do. Some things you may simply want to leave to the experts so why spend time on them? Joomla training by JoeJoomla is customized to your specific website workflow. Prior to setting up training sessions we will determine what you really want to know in order to become productive in your job. We structure the training to suit you best. Not everyone learns the same way. 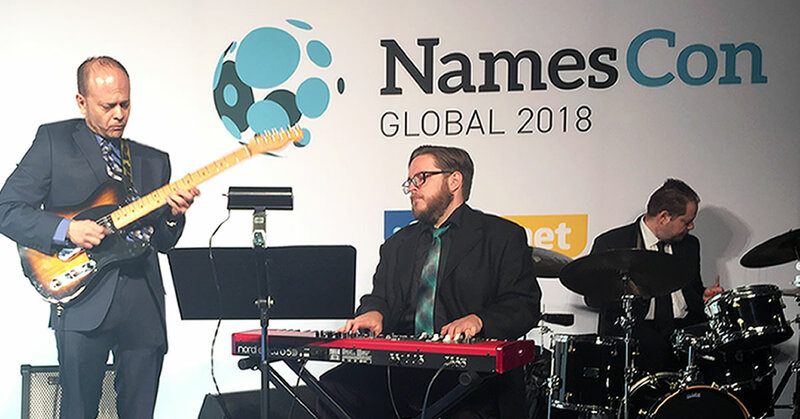 Do you do better with in person sessions or do you just need to see how something is done? Sessions can be live at your office or online by remote video conferencing. Convenient schedules suitable for everyone involved. Whether it’s training for one person or a group of people the sessions can be organized into time slots suitable for everyone. Full or half day sessions for groups or even scheduled 2 hour sessions as needed. Would you like a record of your training for future reference? Your online training sessions can be recorded and made available for your personal video library. It’s great to be able to review the training at your leisure. 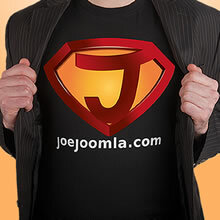 After your training you can receive ongoing support for your website from JoeJoomla. We offer web hosting packages to take care of some of the ongoing maintenance for your Joomla website. Check out our 5 Reasons for JoeJoomla Web Hosting and JoeJoomla Web Hosting Packages. We offer convenient package prices for full and half day training sessions. Block time purchases are also available for online sessions.